Have you ever signed up for a race really far in advance and just sort of forgot about it? 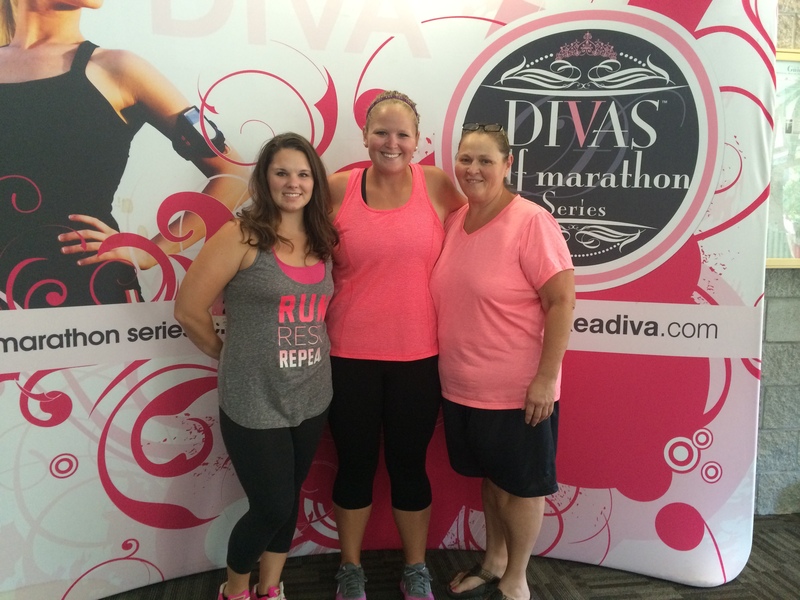 Back in March my Momma, Brittney, and I signed up for the Divas Half Marathon in Peachtree City, Georgia. It was a race we decided to do purely for fun and it would make for a good weekend getaway girls trip. Race week was upon us before we knew it and I began to get nervous. I could obviously complete the distance but the heat and humidity worried me. It took a lot of reminding for me to come to terms that this race was for fun. Brittney and I took a half day off from teaching so that we could have plenty of time to make it to Atlanta and not feel rushed. Momma and I picked Brittney up and the fun began. 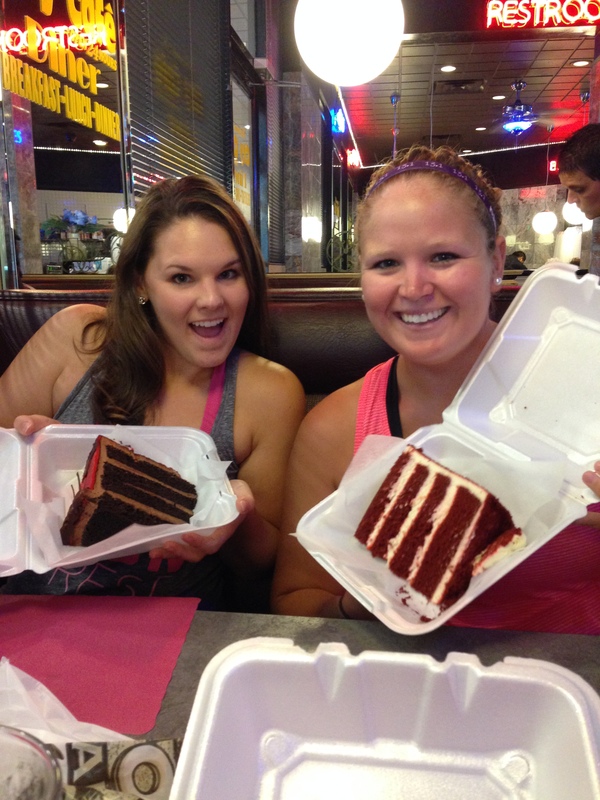 We made a pit stop in Chattanooga for a piece of cake at the famous City Café. It is literally impossible for me to come through Chattanooga and not stop for cake. Try it out if you are ever in the area. After our brief stop, we were back on the road. We decided to head to Expo before doing anything else to ensure we would have plenty of time to browse and get our packets. Packet pick up was in a field house and it was basically a cluster thanks to all the cars in one tiny area. Luckily we found a parking spot and headed inside. Most probably will not agree with me but I love expos. I like to see products in person and obtain some samples and just look around. This expo was extremely underwhelming and left us feeling slightly cheated. They did not even have fuel which put us in a bind since Brittney had planned on grabbing some gels. Packet pick up was efficient and the volunteers were very friendly. 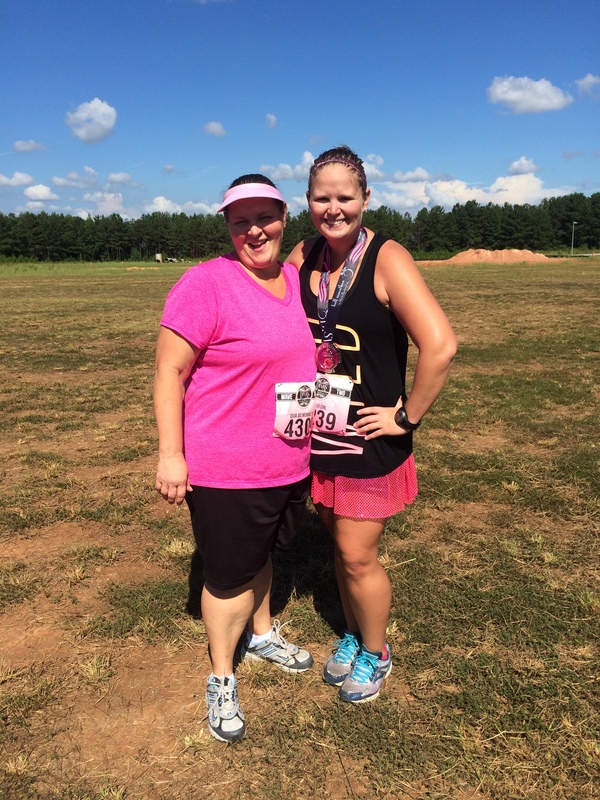 Mom had decided to drop down to the 5k due to some knee issues and it was no problem. We all had personalized bibs and my Momma’s said “Go Momma Pat”. We loved this feature. My big complaint was the shirts. At registration I was excited that they had sizes up to 3X because a lot of times women feel left out when they can’t order their size. However the shirts ran entirely too small. Brittney ordered a medium and ended up taking my 2X shirt while I bumped up and squeezed into my Momma’s shirt that she ordered. That was kind of a bummer so hopefully Divas will work on that issue for future races. After getting our packets we hit up one of our go-to places for dinner. Outback never disappoints. Our server did not know that there was a half in town so we got to explain to her what a race was and she mentioned that her and her boyfriend recently started running. 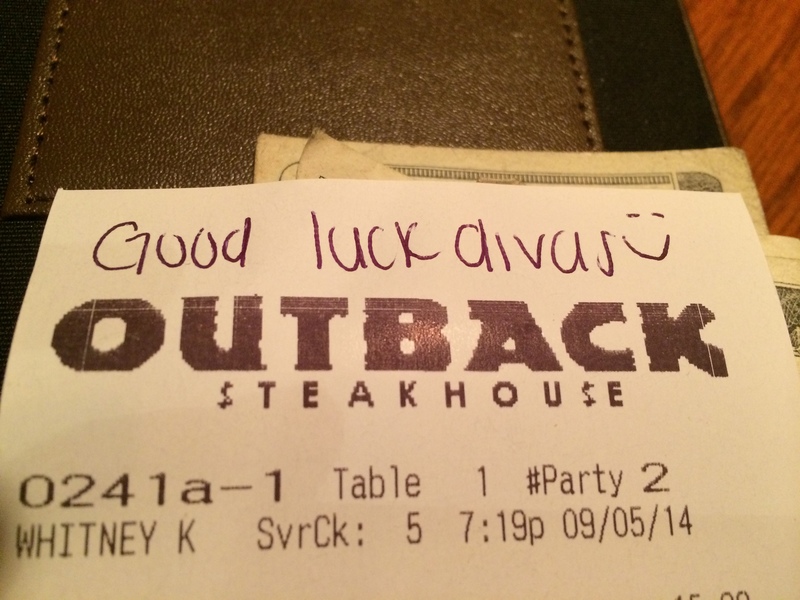 She even wrote us a sweet note on our bill. We were all three pleased with our meal. Race morning came and I don’t think any of us actually wanted to run. We were tired and not looking forward to running in 100% humidity. Thankfully I was able to eat a peanut butter sandwich and banana for breakfast. We stopped in the lobby to request late checkout and I sure am glad we did because it was then that I noticed that I did not have my bib. Rookie move. Once we got on the road we began to realize that traffic was going to be an issue. Cars were lined up for miles and we watched helplessly as the time we were supposed to be on the shuttle passed. Finally after what seemed like hours we made it to the field for parking. Busses pulled up and it was every woman for themselves. People were seriously crazy. We made it right on time and we obviously panicked for nothing although in the future I would highly recommend a better parking situation. The 5k started right on time and we stood by the starting chute in an attempt to cheer on my Momma. Unfortunately we weren’t able to see her so we wandered around to stretch and hydrate a little before it was our turn. This race used corrals but people sort of stood wherever which was kind of frustrating but it was all for fun so we didn’t really mind. I’m not sure if there was an actual gun start but everyone started running and we followed suit. The first couple of miles were on roads and had a few hills. The hills weren’t like the ones that we have in Knoxville but were more long inclines. We decided to run the first three miles and then switch to run/walk intervals after that. The humidity was out in full force but I’m glad that the race organizers were honest when they said that the course was shaded. The sun was rarely on us at any point in the race. Around the three mile mark the course switched to a cart path. I honestly wasn’t looking forward to this section but I ended up LOVING it because you never knew what was going to come next and it felt like a casual run on the greenway instead of a half marathon. The only hard part was a few congestion issues but even that was rare. Water stops were plentiful. I read on the Divas Facebook page that some women were complaining about the lack of water stations but Brittney and I would both agree that were far more than any other race we have done. I believe we counted ten and two of them towards the end were only a half mile apart. Given how hot and humid it was, I was beyond thankful for plenty of hydration. The cart path allowed the race to remain shaded and we kept a solid pace with our run/walk intervals. After mile five we took some gel and that really boosted our energy for the rest of the race. Our run/walk intervals dropped to about 3ish minutes running to 1:30 walking. I was kind of disappointed to see our pace drop but I can honestly say we were having SO. MUCH. FUN. Chatting with Brittney made the time fly by and even though we were quite literally dripping with sweat, we were enjoying ourselves. I kept commenting on how this is one of the only half marathons I have ever done that I actually had a good time at. We texted my Momma at every mile marker since we knew she was waiting on us at the finish line and she sent lots of encouraging texts our way. Finally we were within range of the finish line. Some local high school cheerleaders were handing us feather boas and tiaras so that we would look like true divas at the finish line. Brittney and I both passed on the boa but took a tiara. The finish was at the corner of a long incline. We put our pride to the wind and powerwalked up that hill like it was our job and kept a lookout for my Momma the entire time. Once we rounded the corner we took off and finished strong. There was pink everywhere and so many people yelling and cheering for all finishers. I could hear Momma screaming the loudest of anyone. The finish line chute was fantastic. Handsome fireman were there to hand out our medals and they had volunteers there to give us champagne and roses. We were truly pampered like Divas. The post race food selection didn’t have a lot of variety but it was nice to have volunteers to hand us our snacks. We found my sweet Momma who ROCKED her 5k and made our way back to the shuttle since we were already cutting it close on check out time at the hotel. 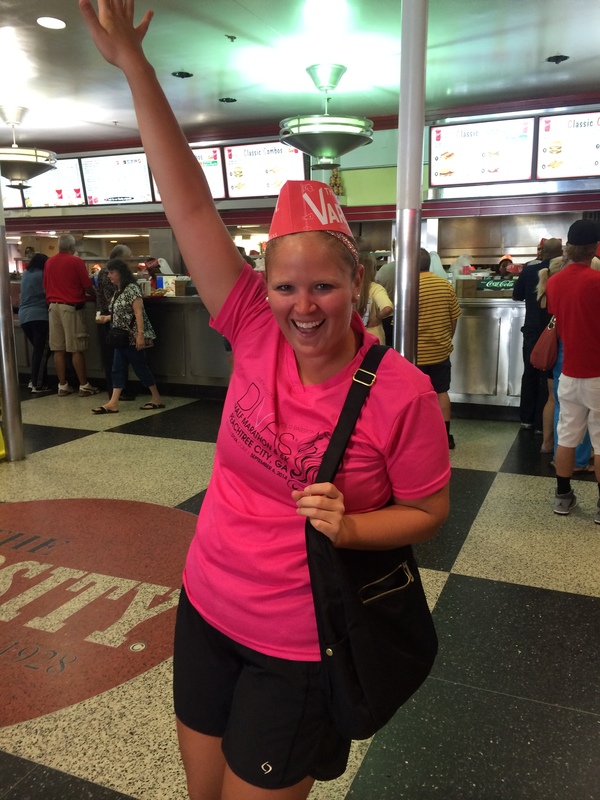 Once we showered we were on the road headed back to good ole Tennessee but not without a stop for post race refueling at The Varsity. We ordered every artery clogging thing on the menu and didn’t even think twice about it. We also swung by IKEA to check out some things since Brittney and Momma have never been. It was a lot to take in but my gosh how can you not love that place? I think all three of us were thankful to finally get home and get some rest. It was a quick trip and although the race had a few logistical issues, it was a great course with plenty of water and support and the bling was completely perfect. I would definitely do this race again and I’m already looking forward to my next destination race. 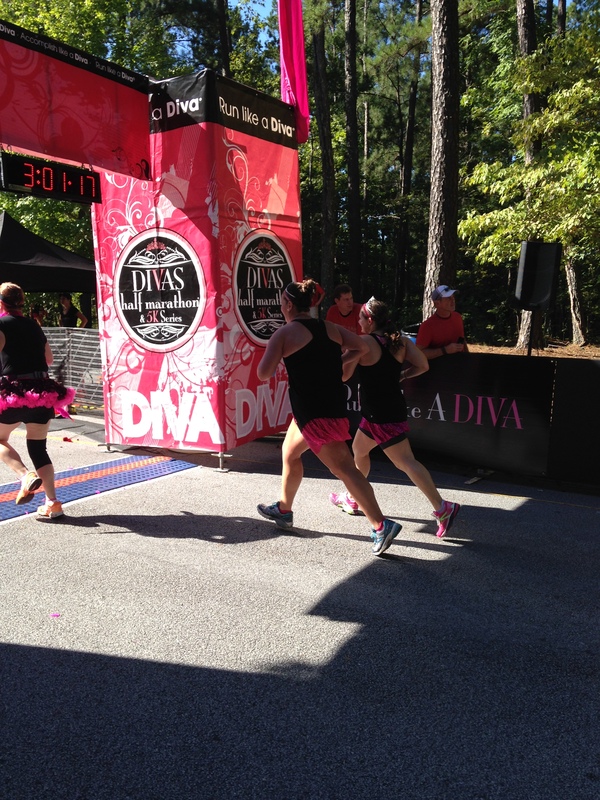 Have you done a Divas race or an all womens race? What is your favorite post race meal? 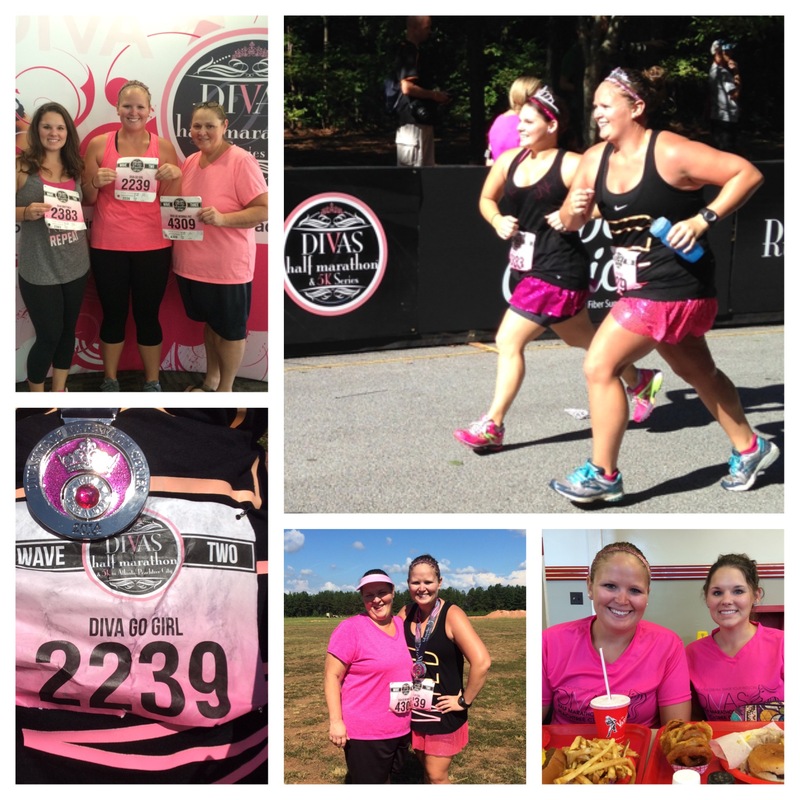 This entry was posted in Race Recaps and tagged divas half marathon, race recap, run like a diva half marathon by thegogirlblog. Bookmark the permalink. Thank you so much! She really is a cutie and I’m so glad we got to check off another race together! She is awesome. “What’ll ya have? What’ll ya have?” I haven’t been to the varsity in years!! Congrats on a great race! I did zooma way back in the day (second half marathon) and it was okay. I’m not a fan of women only races- too fru fru for me :):) fav post race meal is a good brunch or burger! 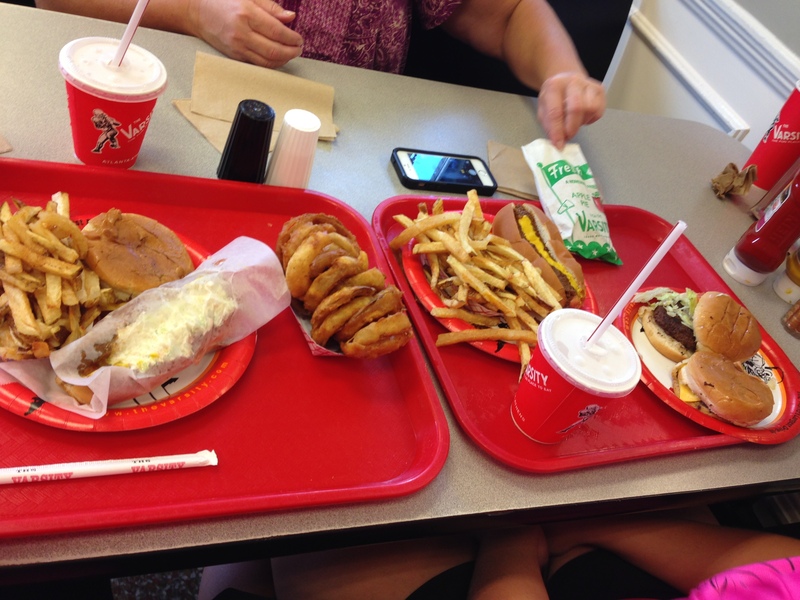 It is probably best that you haven’t been in years…talk about artery clogging! I agree that women’s race tend to be a little “fluffy and fru fru” but I can get on board with all pink decorations and an awesome medal. Burgers are THE BEST post race food. That looks like such a fun race! you and your mom look great! I had the same issue this weekend with the AF Marathon shirts, they were like kids sizes! What a bummer! It is so depressing when race shirts don’t fit…isn’t the whole purpose to display them with pride? Maybe these races will take the comments into consideration next year. You are all fabulous divas! 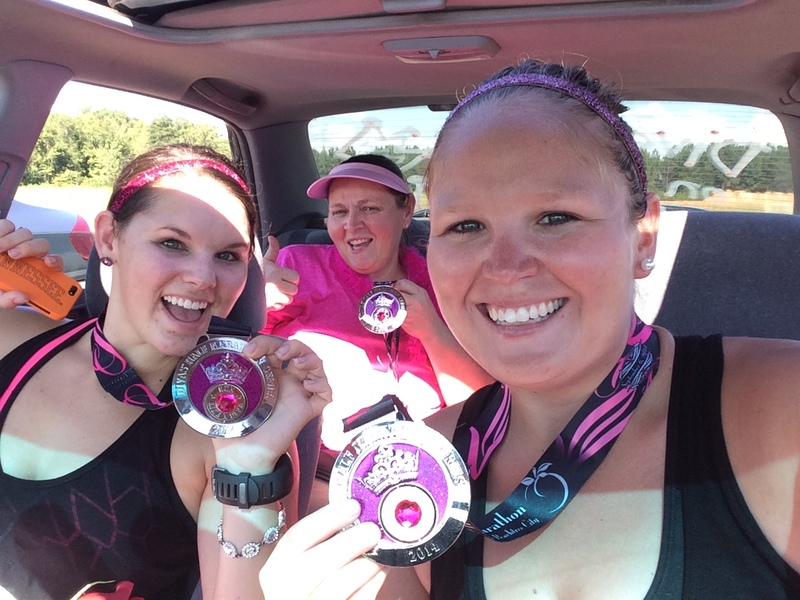 I’ve done the Go Girl Run Half here in Missouri, which you should totally do since it is your blog name. 🙂 There are three total in the state, and I think they are adding a 4th. There’s a 5K, too. Nice job! This one looks like a lot of fun! And sounds like plenty of water stops. That’s usually one of the first things I check and see if they list the water stops. I think I drink more than the average person on a run or something haha. I have a Knoxville question for you! I’m coming to town the weekend of Nov 14 and I’m supposed to log 11 miles that weekend for half training. Where are some good trails in Knox that I should check out?